So far, The Elements Unearthed Project has operated out of Mountainland Applied Technology College (MATC) where I teach courses in Media Design Technology. My students have worked on this project as part of their coursework in media design; by forming teams and planning and executing a complex professional-level project, they are learning marketable skills, which is the main mission of our school. As such, the expenses for this project have been covered by my school program budget. However, the time is now here when this project must move away from MATC and find its own way; if I continue to pursue what is essentially my own idea and have students work on it further, I would risk running into conflict of interest issues. Also, to do this project justice will take more than the part-time work I have donated so far; it will require an almost full-time effort by me as well as much effort by other people, such as team mentors and project advisors. It can’t just be my project any more but needs the involvement of additional people to guarrantee success. That’s where you come in. Those of you who have begun to read this blog (and the stats show that your numbers are growing) can help this project in several ways. You can contribute through (1) commenting on these posts; (2) acting as evaluators and beta testers for our scripts and podcasts (once posted); (3) mentoring a team in your local area; (4) acting as a Subject Matter Expert for a local team; or (5) contributing funds through your buisness for the continuation of this project or for team equipment needs. Let’s look at each of these. Commenting on These Posts: I haven’t done much to advertise or link this blog into other related blogs, such as Citizen Science, etc. I have been waiting until we have this first round of podcast episodes done well enough to post to this blog and upload to aggregate sites. At that point we’ll have something substantial to show and will need all the feedback we can get, both here in the form of comments on these posts and in iTunes and YouTube and by sending in the feedback questionnaire (here is the PDF link again). We’ll be ready for this by June 1. We’ll add the final scripts as new links and ask for comments and feedback. We’ll also post the rough draft video clips and ask for editing advice and other constructive criticism. Anyone can help, especially if you have expertise in the subject. 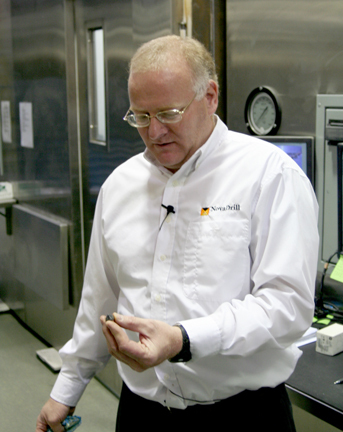 Francis Leany, our Subject Matter Expert at Novatek. Forming Your Own Team: I hope to begin Phase II (see previous posts for the phases of this project) at the start of September by soliciting teams of students and/or community members from specific towns in Utah. Instead of MATC students doing the work, I will travel to these towns and provide necessary training to local teams, then help them set up, plan, and carry out their tours, videotaping, and final editing. If you are a high school chemistry, history, or media teacher or you are a member of a community historical society or similar organization and would like to put together a project on the history of science and chemistry in your own town, then please contact me. I have a link here for the PDF form to apply for a team. Ideally, the team would have about 6-8 official members including 5-6 students, a teacher, a community leader, and a Subject Matter Expert such as a local historian, museum director, or scientist or engineer at a chemical plant. The students should be either in high school or be highly motivated middle school students. They can be science students, media students, history students, or even art students (we need all these skills). Their parents can also join the team as members; our goal is to make this truly a community-based project, much as citizen science efforts are being formed presently. Consider this to be a citizen history project. Contributing Funds to this Project: Since this project is now becoming independent, it will need funding in order to continue. I have applied to various grant agencies, with mixed success so far. I have been turned down by the Sloan Foundation and the Corporation for Public Broadcasting for an earlier version of this project; the National Science Foundation turned down my initial application but encouraged me to reapply, saying all that is still needed is more sponsorship and better assessment strategies but that the idea itself is sound and very much needed. My major success so far has been my acceptance to a Fellowship this summer at the Chemical Heritage Foundation in Philadelphia (here’s the link) which is supported by the American Section of the Societe de Chimie Industrielle (here’s their link, too). This generous support will allow me to stay in Philly for three months researching the foundations of chemistry and acquiring images and diagrams from CHF’s vast collection of historical manuscripts that can be used for episodes of this project. They are already doing an audio podcast called Distillations (here’s the link) that I highly recommend; I hope our video podcasts will also find a home at CHF in addition to this blog. The funds that are donated can be used for the general development of the project (paying for my travel expenses, for example, to visit the teams) or they could be donated to specific teams to help them buy necessary equipment such as video cameras, tripods, microphones, and computer software. For example, if your business was involved in chemical manufacturing, you might sponsor a team to tell the story of your business and industry. You help them with funds and expertise (in the form of a Subject Matter Expert) and provide access to your company for tours and information. Then any video or photos the team shoots, including the finished podcasts, can be used by your company for PR or marketing purposes (although we’ll retain the copyright on the materials). It’s a win-win situation: you help support your local schools (a tax write-off) and get students excited about STEM careers; they help advertise your business. I hope to develop a number of partnerships for our next group of teams. We’ve already had great cooperation and help from such companies as Novatek in Provo, Utah; Holdman Studios at Thanksgiving Point; Brush Engineered Materials in Delta; and Ash Grove Cement in Leamington. 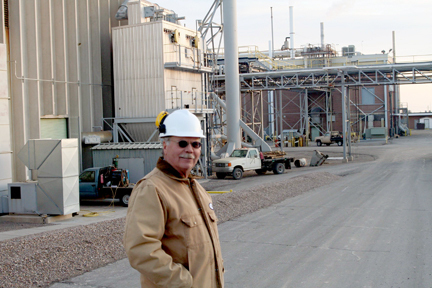 Phil Sabey at Brush Wellman plant; Dec., 2007. I will be contacting some specific industries, organizations, and individuals that can be sponsors or advisors for this project. My goal is that before I leave for Philadelphia, we will have several sponsors on board for the next phase. To contact me about contributing either your expertise or funds for this project, please e-mail me at: dblack@mlatc.edu or you can phone me at: 801-787-0512. I hope to hear from you. Time is rushing forward and we are almost to the end of another school year at Mountainland Applied Technology College. Students in my Multimedia classes have been working daily to complete the alpha or “Director’s Cut” versions of their group video projects. Altogether, four projects will be completed within the next three weeks. These include projects titled: The Art and Science of Blown Glass (that group is currently creating their B-roll titles, images, and animations); The Art and Science of Stained Glass (this group is doing rough edit); High Pressure Alchemy: The Story of Synthetic Diamond (this group is capturing and editing the narrations); and The History of the Tintic Mining District (currently being captured and transcribed). 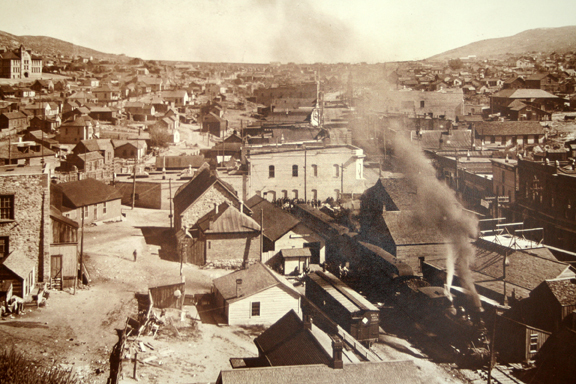 This last project came about rather unexpectedly; the Tintic District is centered around the town of Eureka, Utah and was one of the richest mining areas in the West in the late 1800s. By 1960, the mines had closed and the town has since fallen on hard times. It is now designated as an EPA Superfund Site, and millions have been spent to cover up old tailings piles and replace contaminated soil. We had a team of students last year that filmed the area, but we didn’t have a good Subject Matter Expert that could tell the story. 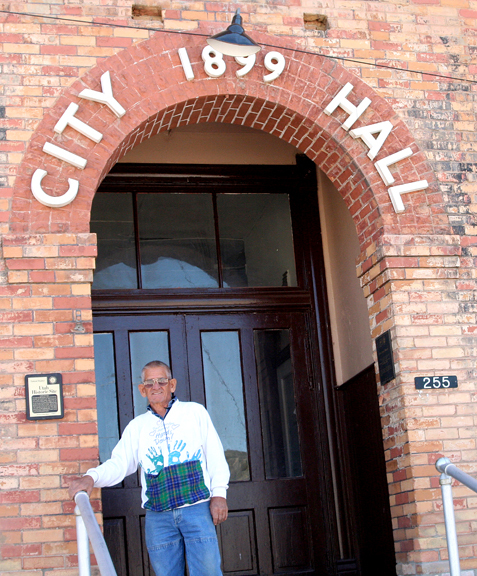 After driving through the town in early April, I saw that many of the historic buildings downtown are literally falling down and that this story needs to be told now rather than waiting for funding (my biggest challenge, besides having a full-time teaching job, is that I have no sponsorship as yet to support this project). I had one group of students that was going to do a project on pottery, but we hadn’t located a good site to visit. 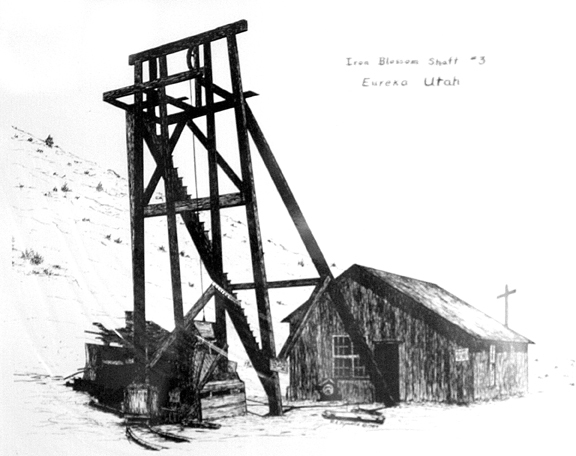 So I contacted June McNulty, who runs the Tintic Mining Museum in Eureka and arranged for him to be interviewed and to show us through the museum (which is only open by appointment) in an effort to preserve the history of this area before the reclamation efforts change things forever. On April 21 we took this team of students to Eureka and interviewed June and filmed the contents of the museum. 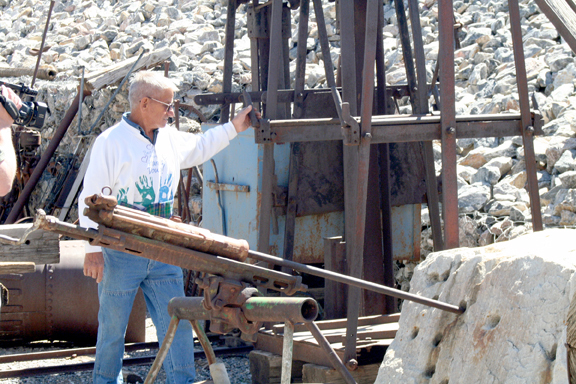 Now I am going to be working on a final synthesis of two year’s worth of footage into two or more podcast episodes – one will tell the history of the mines, the other the history of the town and what life was/is like there, and perhaps a third will talk about the recent clean-up efforts and their impact on the town. The four projects will be completed by students and myself to an alpha test level by May 21, when we will have students from other classes at MATC watch the episodes and make comments and suggestions. At that point we will be too close to the end of the year for the students to do much more editing, so I will probably work on them over the summer to tighten the presentation/story and polish the images and audio. It will be a challenge getting this all done over the summer, since I will be in Philadelphia for three months researching background information and collecting images and photos on the history of chemistry in general at the Chemical Heritage Foundation, where I have been selected as a 2008-09 Fellow, sponsored by the Societe de Chimie Industrielle (American Section). This effort at CHF will result in at least two episodes as well, in addition to the four episodes this year and two from last year that I will be doing final edits on. My goal is to have 8-10 episodes completed and posted to this site and to iTunes and YouTube by the end of August. So far I have completed one episode on the rationale for this project. I will post that episode before leaving for Philadelphia (May 28) so that we can at least have a presence on iTunes and YouTube over the summer. I have been waiting until May 22 when I will be teaching the students how to compress and add metadata to podcasts; I’ll demonstrate how with this episode and take it all the way through posting and uploading to iTunes. Later today or tomorrow I will be adding a new post on how you, as an individual interested in this topic, can conduct similar research in your own community, or how you can participate to evaluate episodes or to provide sponsorship for this project. June McNulty by mine hoist cage.